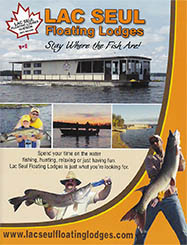 Lac Seul Floating Lodges - Hudson, Ontario: Fish Lac Seul on a private house boat and stay where the fish are! Stay Where the Fish Are! 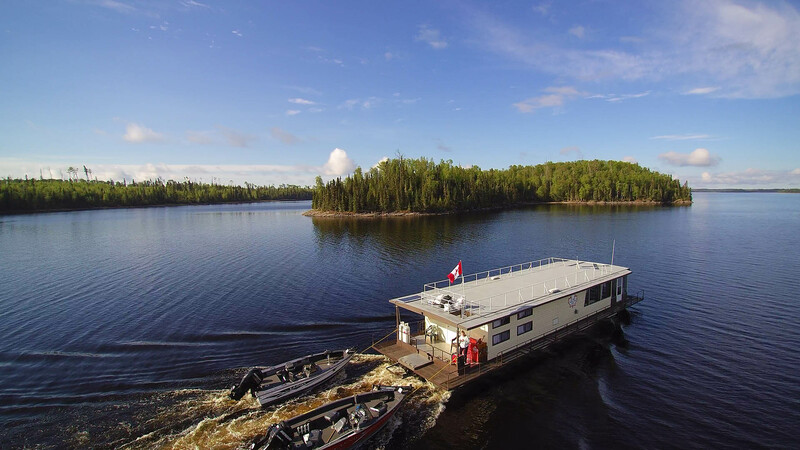 Providing our guests with an enjoyable houseboating experience for over 40 years, Lac Seul Floating Lodges is located on Lac Seul with our docks in Hudson, Ontario. With world class fishing for walleye, northern, musky, and smallmouth bass at your doorstep, avoid the long commute to and from a traditional lodge every day by staying on a houseboat. Get away from the crowds and enjoy the beauty and splendour of life with a houseboat rental. Lac Seul Floating Lodges can provide you with a complete vacation package to satisfy all types of groups. Come and enjoy some of Northwestern Ontario's pristine wilderness with all the comforts of home. Not interested in fishing? Bring your canoes or kayaks and explore all the nooks and crannies that Lac Seul has to offer. With the wildlife in their natural setting, awesome sunrises and sunsets, make sure to bring your camera. Lac Seul has something to offer everyone. Whether you are a family or a group of friends, Lac Seul Floating Lodges can help you plan a houseboat trip for memories that will last a lifetime. check availabilitycontact us to book your trip! All of our 75' houseboats are equipped with Zoll AEDs. Now available for rent are brand new 2019 Honda 20hp motors for our Alumarine fishing boats. Still available are the 2018 G3 17'7" fishing boats with Evinrude 60 HO E-TEC motors. Starting at $585 PER PERSON! Contact us to find out more. Take a virtual tour and go inside one of our houseboats. Vacation packages for the 2019 season are available. Check availability now! Use the buttons below to like our facebook page and stay up to date. We post plenty of pictures all year round! With 11 houseboats, Lac Seul Floating Lodges can accommodate groups of many sizes. All our houseboats come fully equipped with a decked out kitchen, multiple bedrooms and full bathroom with a tub and shower. A BBQ, generator and safety kit are also among the many standard features that come with all our houseboats. Our houseboats come equipped with one complimentry 16 foor fishing boat (no motor). Additonal boats and motors are available for rent. If you’re looking for a larger boat, we also offer G3 fishing boats with 60hp HO Evinrude E-Tec motors. Reservations fill up fast so check availability and book now! Memorial cairns are located around Lac Seul to honour those Hudson members who fought and died in WWII. Visit this page for information and to support Legion Branch 139.